Data visualization is the art and science of creating graphic representations of numerical data. The Flocking Diplomats series consists of multiple visualizations of a rich body of data concerning the parking violations of international diplomats in New York City. This conceptual project employs the poster as a research tool, much as “posters” are used in scientific conferences to share research outcomes as static graphics mounted to poster boards. FD-1 tracks violations hour by hour, 1999–2002, and plots them in relation to the position of the sun as seen from Central Park. FD-2 focuses on the twenty diplomats who perpetrated the most violations in 1999. Such works emphasize the of the designer as commentator, author, and journalist. 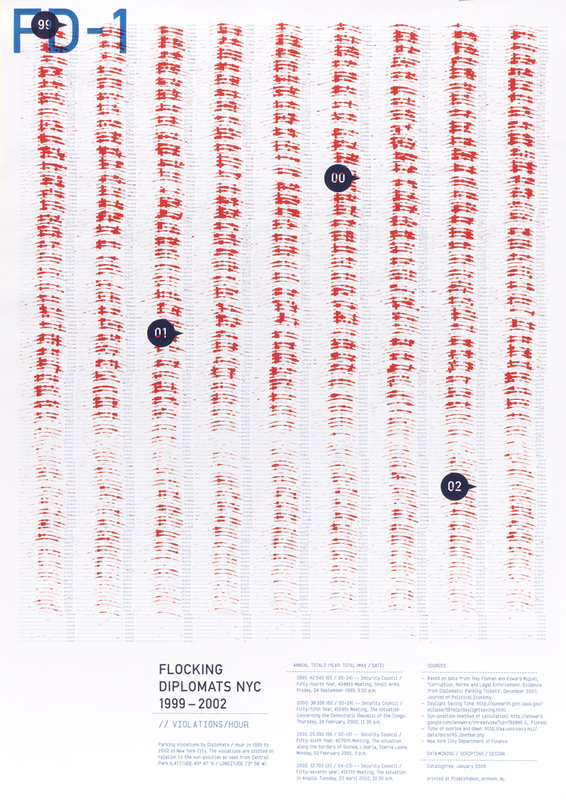 Poster, FD2: Flocking Diplomats New York: Individual Frequency Traces 1999, 2008. Designed by Catalogtree (Arnhem, Netherlands): Joris Maltha and Daniel Gross. Offset lithograph. Printed by Plaats Maken (Arnhem, Netherlands). 100.2 × 68.9 cm (39 7/16 × 27 1/8 in.). Gift of Joris Maltha and Daniel Gross, 2009-30-1/6.